Wild populations of the St. Vincent’s Amazon (Amazona guildingii) have been devastated by trapping for the live bird trade, hunting, and loss of habitat and nesting trees. 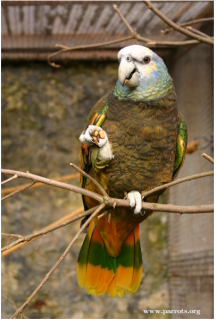 Outcomes: From 1990 to 2001, the World Parrot Trust supported the St. Vincent Amazon by providing veterinary help (Andrew Greenwood, 1994), funds to carry out much needed surveys of populations and habitat, and aviary construction for captive breeding populations. The Trust has also produced a very successful series of conservation educational buses in Central America, including one for the island of St. Vincent. Researchers have suggested to continue to monitor the population and build on existing protective measures, including the development of the captive breeding programme. They also recommend researching the reproductive biology and movements of the species. Where found: Located only on the island of St. Vincent in the Lesser Antilles, West Indies. History: The St. Vincent’s Amazon (Amazona guildingii) is found on the upper west and east ridges of Mt. Soufriere on the island of St. Vincent. The species’ greatest declines occurred in the 20th century until the early 1980s and was caused by trapping for the live bird trade, subsistence hunting, and loss of habitat and nesting sites from forestry and agriculture. These human pressures have resulted in a listing of Vulnerable by IUCN, Appendix I by CITES. Ecology: This parrot inhabits mature moist forest at an elevation of 125 to 1000m (410-3280 ft), with occasional visits to cultivated areas and gardens. It feeds on the flowers, nuts, fruits and seeds of many plants such as Ficus, Clusia and Cecropia. Gregarious and usually in flocks of 20 to 30 birds, this Amazon is otherwise seen in pairs; birds will defend area around nest while breeding but will allow flocks of a dozen birds to be in the same area while feeding and roosting.